Dr. Dawson often talks about Dentistry being the best job (and even hobby) in the world, and I’d have to agree. Our profession allows us to change lives. Some patients don’t even realize how much their lives have changed while others appreciate it beyond belief. What we’re doing is saving teeth and the health of our patients. It’s a huge, huge undertaking and I couldn’t be more proud to be part of it. In order to make this kind of impact on our patients and deliver the best possible care, though, there are two requirements. 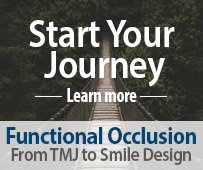 First, we must understand the various factors of occlusion and overall how the masticatory system functions. And second, Dentists must work side-by-side with their Lab Technicians. The end goal for the Dentist, Lab Technician and patient is the same: to always deliver dentistry that is comfortable, beautiful, long-lasting and requires minimal adjustments. Even those that have a sound understanding of the masticatory system can fall short of this goal. In 35 years of doing cases with Dentists, I've noticed 3 common mistakes dentists make. 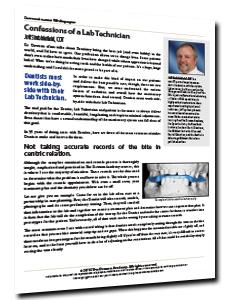 In my whitepaper, "Confessions of a Dental Lab Technician," I will not only tell you what those 3 mistakes are, but tell you how to fix them and give you tips for working more effectively with your lab. 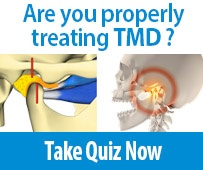 To download my free whitepaper, click the image below. 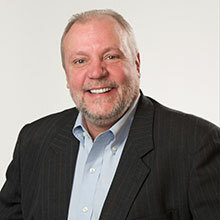 Jeff Stubblefield, CDT has over 33 years of experience as a dental technician with Dental Arts Laboratories, Inc. He currently is the Manager and Technical Director of the DAL Signature Restorations Laboratory, a division of DAL specializing in highly esthetic restorations.